The only evidence presented to the court were photographs of PSNI members taken from Mr Murney’s Facebook page. The photographs catalogued and documented the harassment of nationalists and republicans in Newry, including Mr Murney himself -- but were darkly described by the prosecution as “terrorist” information. Republicans have always held the view that Mr Murney’s imprisonment on spurious charges has been a form of internment by remand to ‘keep him off the streets’ and to suppress his outspoken efforts to denounce the PSNI. Last month, a number of the charges presented against the éirígí activist based on his possession of toy guns were thrown out of court. Last week, the defence made an application for all remaining charges to be struck out, on the basis that there was no case to answer. Although she rejected that application, the judge on Tuesday ordered Mr Murney to be released on bail. 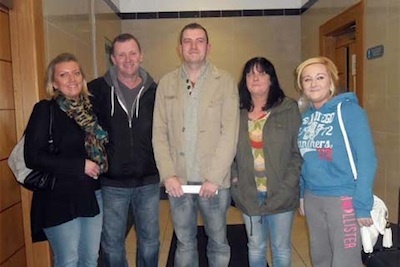 At the end of the fifth days of hearings, and and after 15 months behind bars, Mr Murney was free. 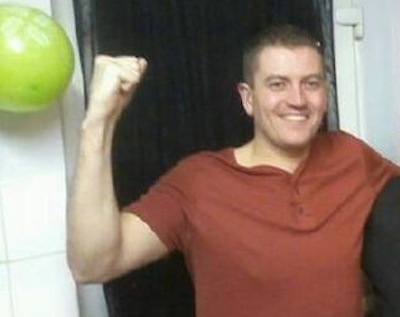 A public relations officer for the local branch of the small republican socialist group éirígí, the Newry man had previously been granted bail -- but turned it down on principle last April after the court required him to wear an electronic restraint. A so-called trial began a day late last week after the prison authorities failed to transport Mr Murney from Maghaberry jail to the court. And bizarrely, no judge was available to hear the case. Once it got underway, the prosecution case took just 25 minutes. It was based on the fact that Mr Murney did not follow an occasional media convention in the north of Ireland that published photographs of the police should not reveal their faces or other identifying information. The practice is a response to the 2000 Terrorism Act, a notoriously vague and sweeping law which made it an offence to publish information about any British police constable “of a kind likely to be useful to a person committing or preparing an act of terrorism”. Mr Murney’s lawyer, Barry McDonald, pointed out that the photographs in question were taken in the course of legitimate political activities, and had been used to accompany party news stories and press releases. He said that that other press photographers and political activists did so “day and daily”. Addressing the court, Mr Murney said: “We are a responsible, non-violent, political party and we work towards a socialist republic. Under cross-examination, he made clear the photographs concerned police harassment, particularly of himself, and that he regarded the PSNI as an illegitimate force. In summation, the defence warned the judge of the wider political and human rights implications regarding the charges against Mr Murney, including infringements of his rights under Articles 7 and 10 of the European Convention on Human Rights. The charges, Mr MacDonald said, related directly to the expression of Mr Murney’s particular political viewpoint as a republican. Both the judge and prosecution appeared taken aback at the reference to Article 10 in particular, with the prosecution stating that they had not expected or prepared for such a legal argument. Accepting final written submissions regarding the various points of law that had been raised, the judge stated that, due to the time already served by Mr Murney awaiting trial, she would accept a bail application. Her statement came as a surprise to all present, and shortly after 5pm on Tuesday, Mr Murney walked out of Laganside courthouse to a hero’s welcome. While a formal judgement will not be issued for another three weeks, few among his family, friends and party colleagues now believe there is any prospect of him being returned to Maghaberry.